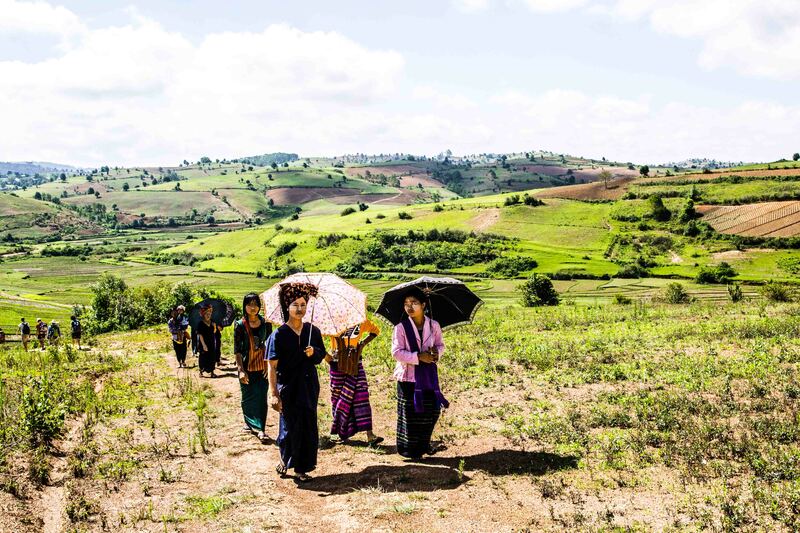 This is part one of two on our Myanmar tips. 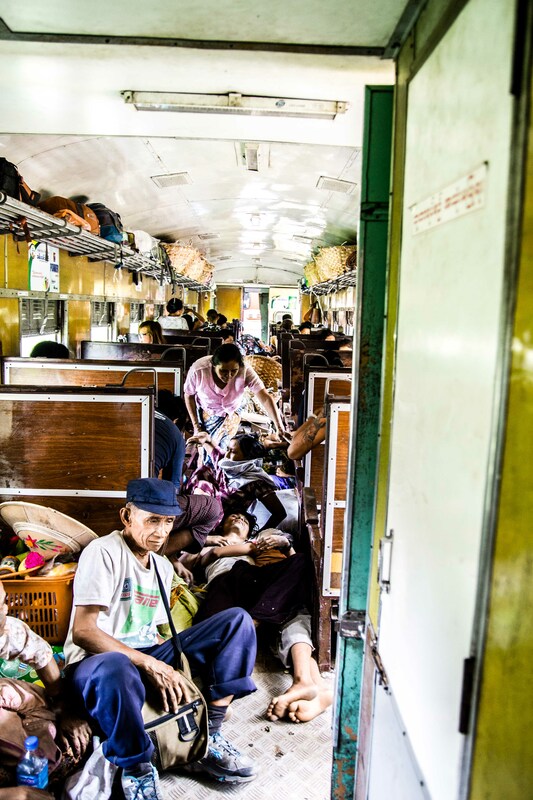 Check out 5 Offbeat Tips for Traveling Myanmar. Stay at Hotel Yadanarbon $45 A/C private bath, amazing breakfast buffet on the rooftop. 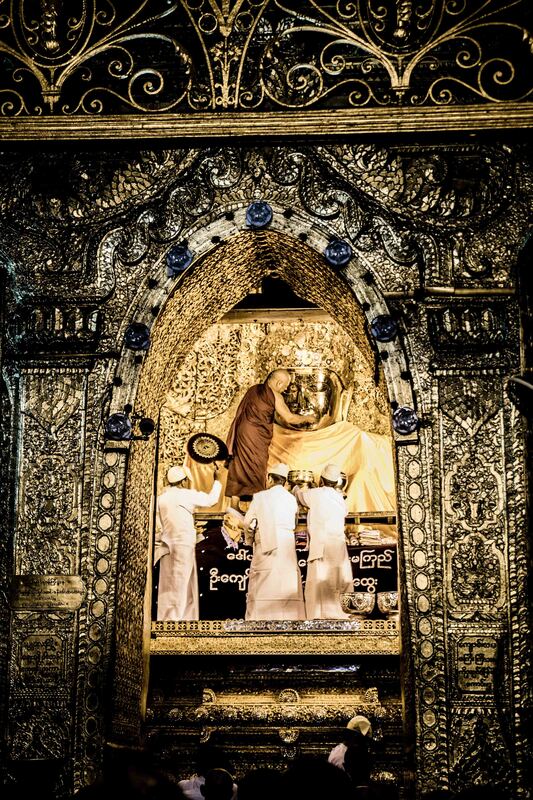 3:30am wake up call to see the washing of the Maha Muni Buddha’s face at 4:30am. 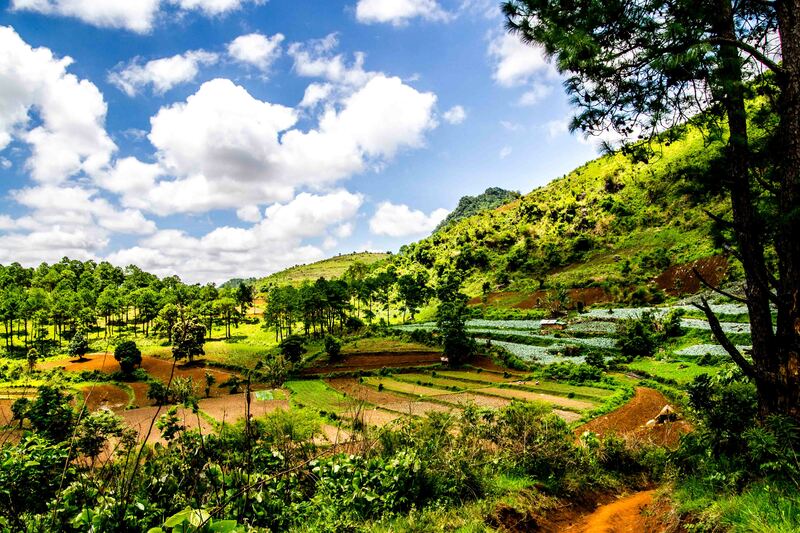 Make your way to the picturesque town of Pyin u Lwin by shared taxi (about $6/pp) or bus/train. In Pyin u Lwin, we stayed at Grace 2. It was fine. $17 Fan, private bath, egg an toast breakfast. For alternatives check out this review. Their sister hotel, Grace 1 is a $10/night more, very lovely and a bit out of town near Botanical Gardens which are a must see. 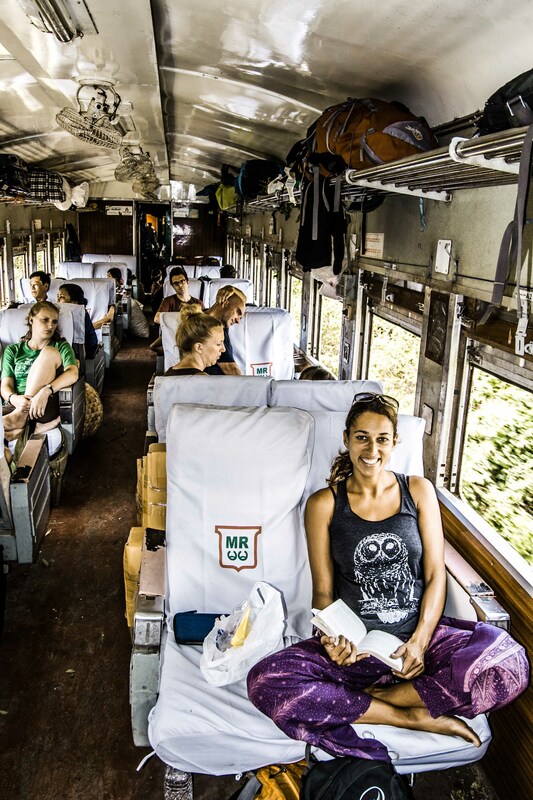 We took the 8:30am train Kyaukme (gorgeous ride, exhilarating viaduct crossing) – Stayed at Ar Yone Oo Guest House $12 No fan, shared squat toilet (worst we’ve encountered), no breakfast. Wished we’d spent the $24 for the A/C room as it was MUCH cleaner and quieter with private western toilet and breakfast. I’m told the only other hotel option in town is much dirtier and government owned. Ride your own scooter or ride with a guide. Dirt bikes also available for the experienced. Contact Joy at joy.inmyanmar@gmail.com for more info. We traveled by bus at 1:30pm to Bagan (VIP bus, about $11/pp), arrived 6pm – Hotel Kumudara. Hotel has the feel of a former 4 star that is poorly maintained. Pool with lovely pagoda views, mediocre breakfast, bicycles for rent. Great movie channels that came in handy for 2 days of food poisoning. Don’t eat at Sunset Garden. 8:30am bus to Kalaw, arrive 3pm. Stay Golden Kalaw Inn. $15 for balcony room, private bath, with fan (temps are MUCH cooler as you’re in the mountains). They also have a new building with modern rooms for $20. Wonderfully friendly staff and nice breakfast included. We hired the guide, Johnny, from Golden Kalaw Inn and while the trek was gorgeous and he was friendly, he’s not the best guide we’ve had (not very informative and we had an incident in the village I thought he handled poorly). I‘m told Sam’s Family guides are great. Depart around 8:30am if you go with Johnny. 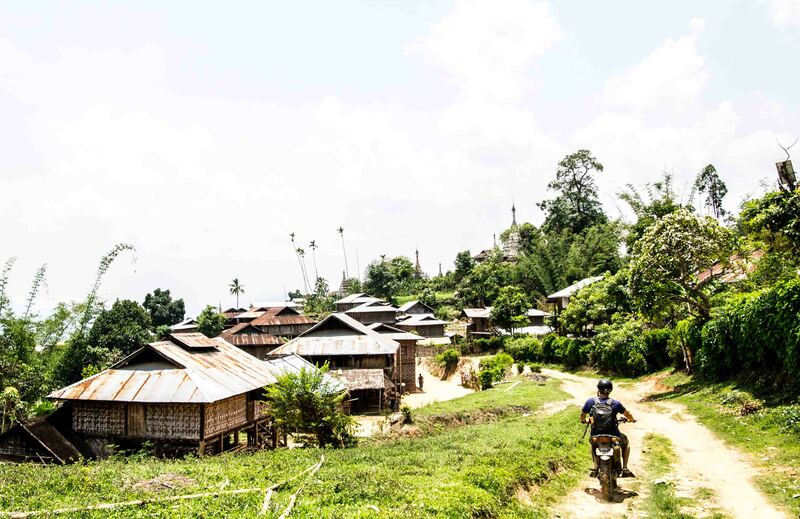 Pine forests, terraced rice fields and and overnight village stay. This is where things went a bit wrong for us. Don’t forget to bring your earplugs! Tip: Bring an umbrella if you’re sun sensitive, you are exposed most of the trek. We overnighted in a lovely monastery. We arrived after lunch to Nyaungshwe and checked into the lovely Teakwood Guesthouse. After two sleepless nights we splurged for an A/C room for $40 and it was well worth the money. 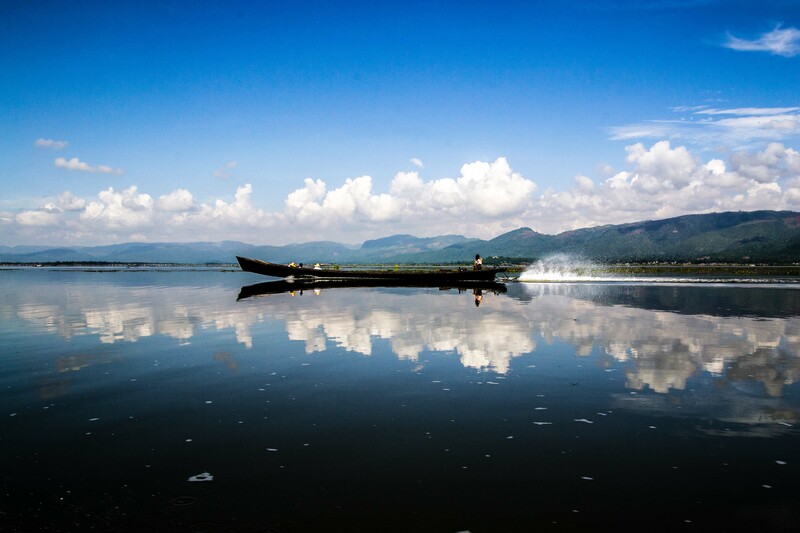 Hire a boat with any of the myriad of travel agents and spend the day exploring the highlights of Inle Lake. 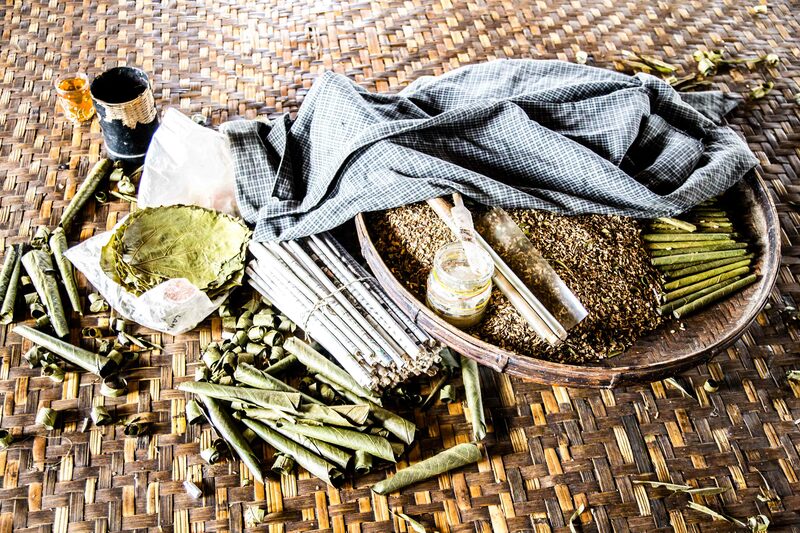 We opted for the cigar, silver and weaving villages, pagoda, and fisherman. The infamous “cat jumping monastery” was on cat holiday. Cats lounging about with a “are you serious?” look on their faces. Cigar makings at Cigar Factory. We enjoyed the anise flavor. Night bus to Yangon departed at 6:30pm (there are many). We went with the JJ VIP bus ($20 I believe) and it was fabulous. Clean, quiet with dinner included (they stop at a restaurant). We arrived Yangon at 10pm. We stayed at the MGM Hotel and enjoyed the meals at New Doreen restaurant next door. Still feeling under the weather I admit we saw more HBO than Yangon. For drinks and a decent meal (tempura appetizers were great) check out Escape Bar located at Kan Yeikthar St. Kabar Aye Pagoda Rd. Same as above with the following extended options. 3 days on motorbike with Joy – we wish we’d gone longer. 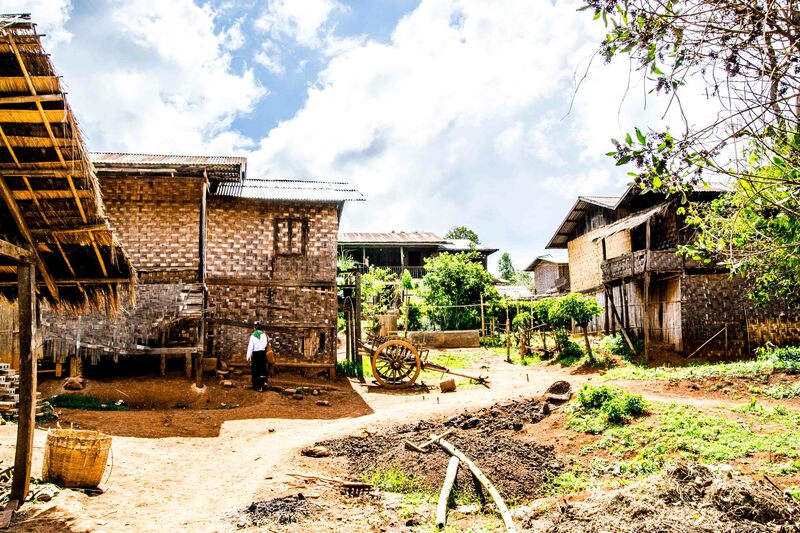 Stay an extra day in Bagan, Kalaw and Inle Lake. Head south to the Adaman islands and Mergui Archipelago and bliss out. First you need a VISA. 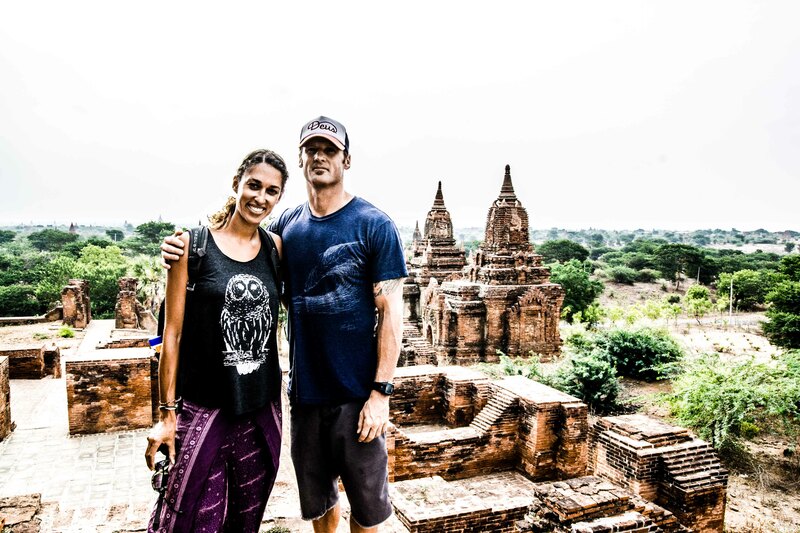 We chose to get ours in Bangkok which was fairly easy after reading this great how-to get your Myanmar visa blog post. One additional tip – check the holiday schedule. We were lucky to be there on the only non-weekend, non-holiday day in 5 days which meant 5x the line, but we still managed to get our same day visas for 1200 bhat (~ $36) each. Asia Air offers great rates from many SE Asia cities. I absolutely love your photos! 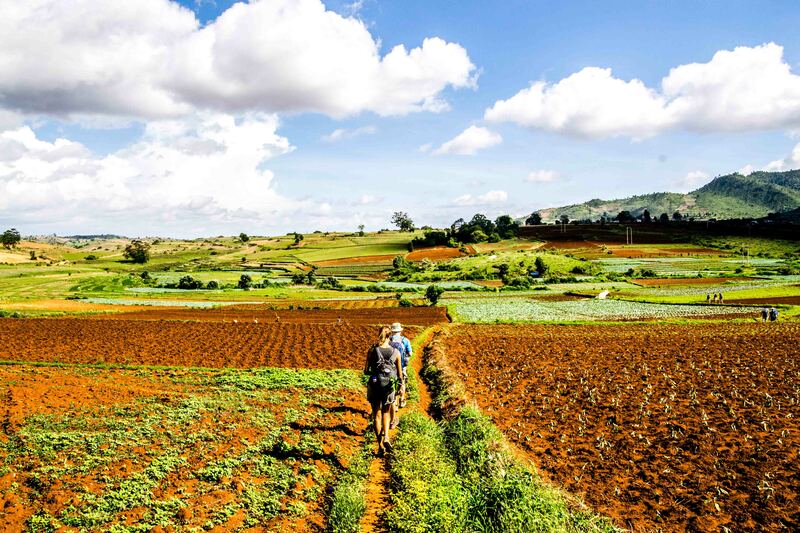 The scenery around Inle trek looks amazing. Thank you! See you’ve been in Bali. We are leaving Ubud for Gilis now, will catch up on your posts. Any must-do recommendations?? Which Gili will you be visiting? We were on Trawangan and Meno, and would recommend Meno, if you like tranquility. Maybe Gili Air would be the perfect mixture of the other two. Hoping to sample all three, starting with Gili T tomorrow and going from there. Saw you had trouble “just showing up” for accommodation so researching now.. Yes, it was a bit hard to find accommodation by the beach. If you try in the village (which is close to the shore), you probably don’t need a reservation in advance. But if you’re looking for accommodation right beside the beach, it’s more of a challange. Great blog. Would love to go there soon. Was the trek pretty flat? I don’t do mountains (unless I am skiing). Would you go back? Thank you! 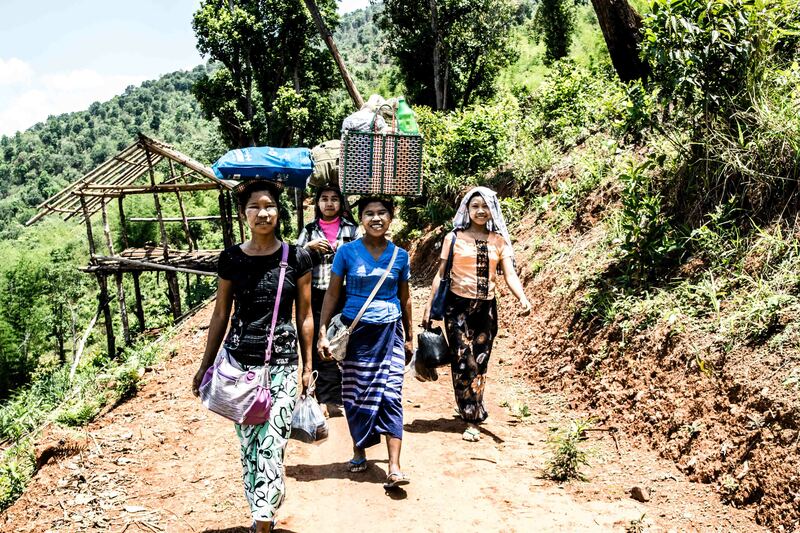 Yes, aside from a 10 min climb in the very beginning outside Kalaw the trekking was very flat. Also very exposed so bring sun block and an umbrella if you’re sensitive. I would go back, and I would spend more time in the mountains of Shane State and the islands, and I would not go in May again – WAY too hot! Thank you! Enjoy and let me know if you have any other questions before you go.